My girlfriend Jenn loves ice cream. Every summer the Wallis Run United Methodist Church, located only a few miles from her childhood home in Lycoming County, PA, would have an ice cream festival to raise money for the church. The members of the church would make home-made ice cream. 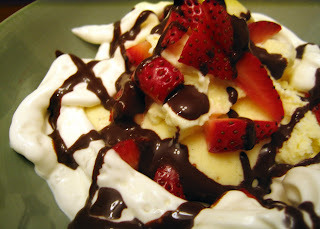 Vanilla, chocolate, strawberry, and banana - and people would come to indulge and to socialize with friends, family, and neighbors. You could also purchase containers to take home. Jenn's favorites were the banana and the vanilla. 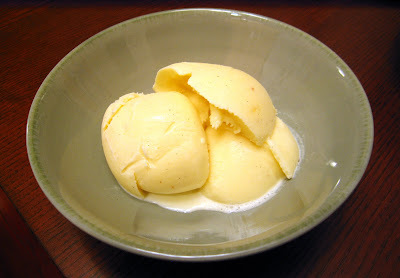 There is nothing like home-made vanilla ice cream; it doesn't taste anything like what you buy in the store. Last year for her birthday I bought an ice cream maker and this past weekend I made vanilla ice cream. She said It turned out just as delicious as during the ice cream festival she grew up with! I think part of the reason it turned out so well was that we used a real Tahitian Vanilla bean instead of the artificial vanilla extract. Jenn's parents went to Tahiti last summer and sent us 3 vanilla beans that supposedly keep for up to 13 years if stored properly. From what I read online about them the best way to tell if they are still good is to smell them. Unfortunately we had been keeping it with our other spices and it was near the curry and chili powder... So it smelled like curry. At first we were worried that we'd have vanilla-curry ice cream, but since it was wrapped up and you have to cut the vanilla bean as shown above to scrape out the goopy-seeds, I guess it was protected from the curry fragrance and it turned out fine. This makes about one quart. First you combine the milk, cream, and sugar in a saucepan and heat it slowly while stirring. You want the mixture to get warm but not boil as it can curdle the cream and milk. Then you whisk the egg yolks and while whisking, pour in about a cup of the warm mixture to temper the eggs and keep them from cooking too quickly. Jenn's sister Laura was in town this past weekend and taught me all about this process. I think this is actually what happened the first time I tried to make ice cream and why we tasted the eggs which was a little odd. Once the egg yolks are in you add the seeds from the vanilla bean which I have pictured to the right. These are the small black specks you see in good vanilla ice cream that lets you know it was made with a vanilla bean and not the fake extract which many times contains vanillin that is chemically treated to taste like vanilla instead of real vanilla beans. You want to split the bean length-wise and scrape out the seeds with the back of a knife. After your mixture is warm enough and you've stirred in the seeds enough that they separate somewhat (I still had a few tiny clumps in mine) you want to let the mixture cool in the fridge. I also added the bean pods to the mixture and let them infuse while cooling for a few hours although it probably didn't need all that long. The next step is to take out the bean pods and add the cooled mixture to the ice cream maker for 25-30 minutes. At this point it will look a bit like a milkshake so you can put it in the freezer for a couple of hours to let it harden a bit more. I wanted to make something a little more crazy and creative but I also wanted to be able to perfect something as simple as vanilla ice cream since my first attempt was a more ambitious raspberry pomegranate gelato and it didn't turn out to my liking. Below I added a picture of a sundae using the ice cream, mainly because it was pretty but want to note that you lose some of the taste of the vanilla once you add the chocolate sauce.